Brie is a soft bloomy rind cow's milk cheese named after the Brie region in France. It’s a beautiful pale color covered in an edible white moldy rind. 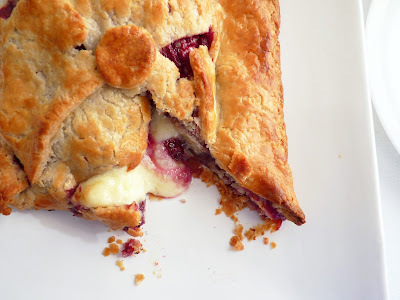 Baking soft brie cheese in pastry is an old party hors d’oeuvres standby. Sometimes chutney is added for a nice counterpoint of bright flavor. It’s a rich and gooey bite to serve for cheese lovers. 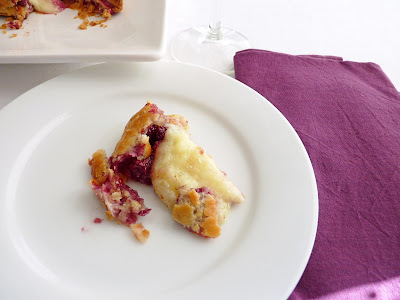 My version is a quick appetizer or dessert course that involves flaky pastry, a small circle or wedge of luscious brie cheese and fresh raspberries and blackberries. The berries really temper the richness and add a nice level of acidity. It doesn’t take much effort at all and presents beautifully while still warm. - The dough comes together very quickly in a food processor. It will not look like a dough but rather like a slightly moist cottage cheese that comes together when you wrap it in plastic to chill (see this illustration). The important thing is to keep visible pieces of butter in tact and avoid blending it all into the flour. 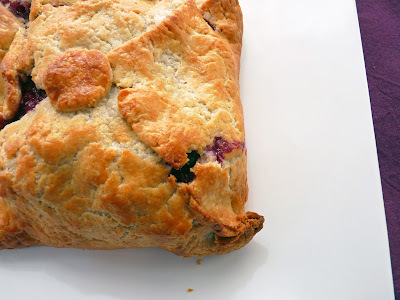 - Dough and berries can be prepared a day or two ahead. - Once you’ve trimmed the edges of the dough, gather the scraps. Roll them out and cut out a topknot. Affix with egg wash.
- If your brie is in the form of a long wedge, just cut it into two pieces across the width and place them together side by side to approximate a square. To prepare the pastry dough, place the flour, sugar and salt into the bowl of a food processor and blend. Cut the cold butter into 1/2" pieces and add to the flour mixture. Pulse until the butter is the size of small peas. Add the cold water and pulse just until the dough starts to clump. The dough will look a bit like small curd cottage cheese. Gather the dough and place on a sheet of plastic wrap. Form a disc and wrap tightly. Chill thoroughly. Place the berries, sugar and water in a saucepan. Simmer over low heat just until softened, about 2 minutes, stirring to prevent scorching. Take off the heat and stir in the lemon juice. Set aside to cool. Preheat oven to 425 degrees F. Prepare the egg wash.
Place the dough on a very lightly floured silpat or a piece of parchment and let it warm up just enough to prevent cracking when you use your rolling pin. Roll into an approximate 10 1/2" square. Trim the edges to form a clean square and set aside the scraps. Move the dough to the baking sheet, then place the wheel of brie in the center. Top with the berries. Fold the corners of dough up and around the cheese, sealing the edges with egg wash along the sides and at the top. Roll out the scraps and cut out a topknot. Use the egg wash to place and secure it at the center intersection of the dough. Brush the whole pastry with egg wash.
Bake until pastry is golden and cheese has melted, about 25 – 28 minutes. Although we normally associate ginger with the dark cakes of the winter months and holidays, ginger also plays well with spring and summer fruit, especially peaches, nectarines and plums. 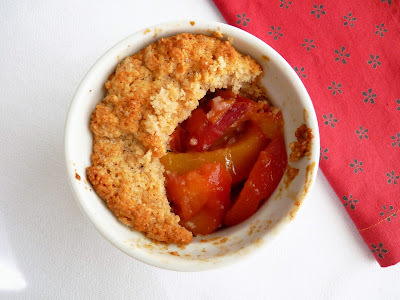 I like Red Lion nectarines and use them here for a simple but delicious cobbler, a must have for this moment in our splendorous fruit season. The recipe is a very straightforward one but I add some fresh grated ginger to the peaches for a nice note of spice that complements and brightens the fruit. It’s times like this that I always revert to these kinds of cherished spoon desserts that never fail to impress. You must indulge at least once, sometime soon. No muss, no fuss; simple and just plain good. 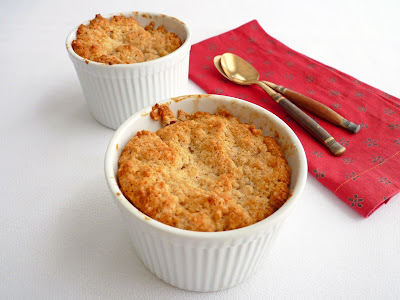 - I made individual servings but you can also use an 8” baking dish and make one cobbler. - Taste your nectarines for sweetness and add sugar to taste. Mine were pretty sweet so I kept the sugar to a minimum. - You can substitute peaches for nectarines. - You can substitute heavy cream or sour cream for the buttermilk. - I use an ice cream scoop to portion the dough, then spread it out evenly to cover the fruit. Preheat oven to 375 degrees F. Place six 4” x 2” ramekins on a baking sheet. For the filling, cut the nectarines in half and remove the pit. Cut into 1/2” slices and place in a bowl. Toss with the lemon juice and the sugar to evenly coat all the fruit. Add the finely grated ginger and cinnamon and toss gently to distribute evenly. Set aside. For the cobbler topping, whisk together flour, sugar, baking powder, baking soda, salt, ground ginger and cinnamon in a mixing bowl. Cut the cold butter into small pieces and add to the flour mixture, tossing to coat each piece. 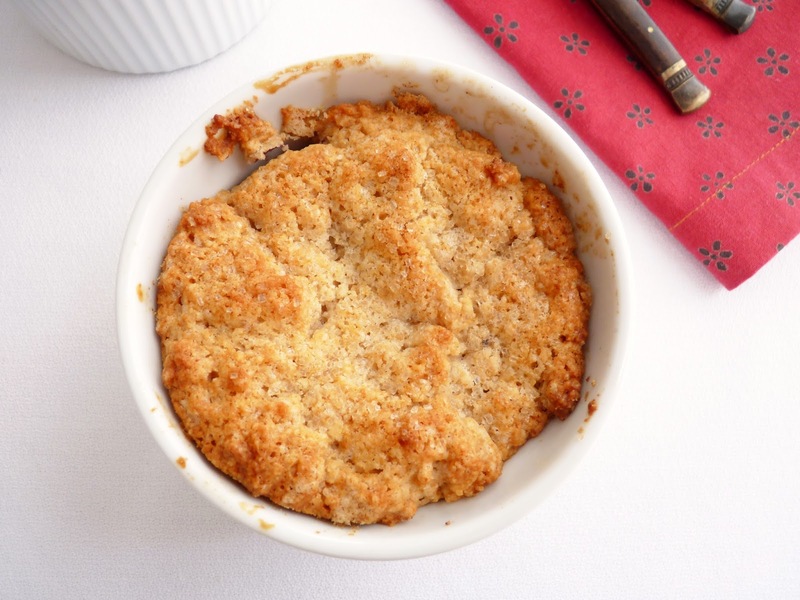 Using your fingers or a pastry blender, blend the butter into the flour until the mixture looks like coarse crumbs. Combine the buttermilk and vanilla and add. Stir with a fork until just combined without any dry patches. Do not overmix. It will not look like a finished dough but a wet, lumpy and clumpy mass. Toss the fruit and distribute into 6 ramekins. Portion the dough evenly on top of the nectarines, covering the fruit completely. Brush the top of the dough with melted butter and sprinkle generously with sugar. Bake until filling is bubbly and the topping is golden brown, about 25 minutes. Serve warm or at room temperature. There is nothing in the world like honey. This sweet nectar is a cherished commodity. And with ongoing reports of bee colony collapse disorder and its threat to the survival of bees, I’ve come to really appreciate it all the more. Bees are such such an essential and integral element of a healthy natural food system, we have to hope that scientists are finding productive ways to preserve our bee colonies. We do not have a future without them. 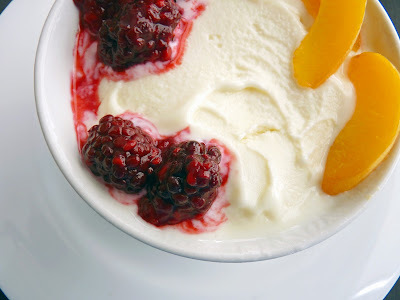 If you do one thing in your ice cream maker this spring, you’ve got to make this super delicious Honey Frozen Yogurt. It’s light, really refreshing and showcases the astonishing earthy flavor of honey. It all starts with a simple plain yogurt, which has become a key ingredient in pastry over the last few years. It’s often utilized as a healthier substitute for other dairy products in recipes for cakes and muffins, biscuits and scones. But here, it’s the star ingredient. The yogurt gets coaxed into perfection with a perfect measure of honey, some lemon juice to brighten the acidity, a slight touch of vanilla and a pinch of salt to heighten the best of all the ingredients. This may be one of the easiest desserts you'll ever make. 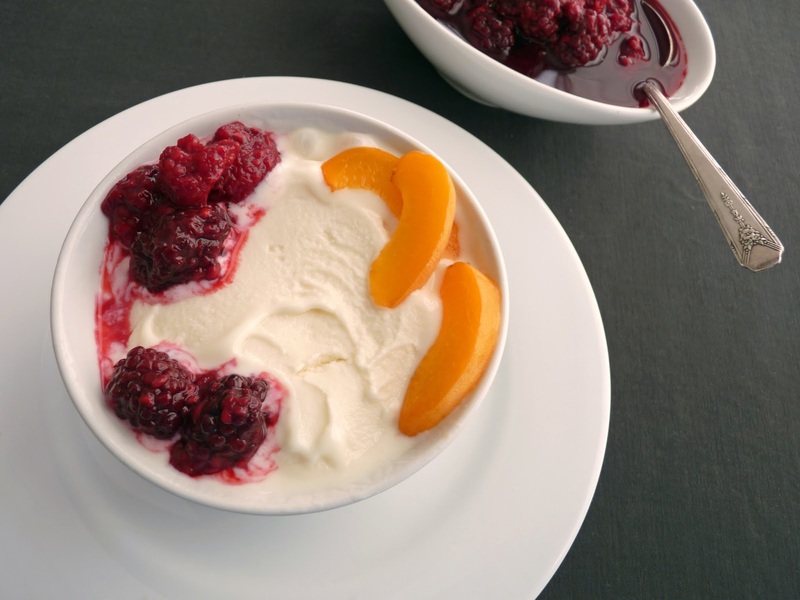 Try it with sweetened berries and fresh apricots or peaches. It doesn’t get any better than this! 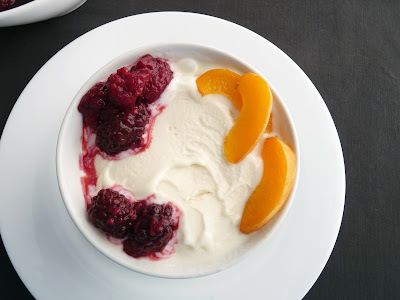 - Since homemade frozen yogurt doesn't contain any commercial emulsifiers, let it sit out for a few minutes to soften before serving if you’ve left it in your freezer for more than a couple hours. - Use your favorite plain yogurt. I’ve even made it with lower fat yogurt and it’s still great. - I use enough honey for good flavor and then some sugar to sweeten. Too much honey inhibits the yogurt from freezing properly. Whisk together the plain yogurt, honey, sugar, vanilla and lemon juice. Add a pinch of salt, to taste. Pour in an airtight container, cover and refrigerate until thoroughly chilled, preferably overnight. Freeze in your ice cream maker according to manufacturer's instructions. Pour into an airtight container and press a piece of plastic into the surface. Cover and place in your freezer to firm up. When esteemed chocolate expert and cookbook author Alice Medrich advises, I listen. Her cookbooks are flawless examples of thorough testing and expertise, which result in reliably superb pastries and desserts. It’s no wonder every cookbook she releases is an instant hit and award winner. Alice is particularly proficient at creating wonderful cookies. 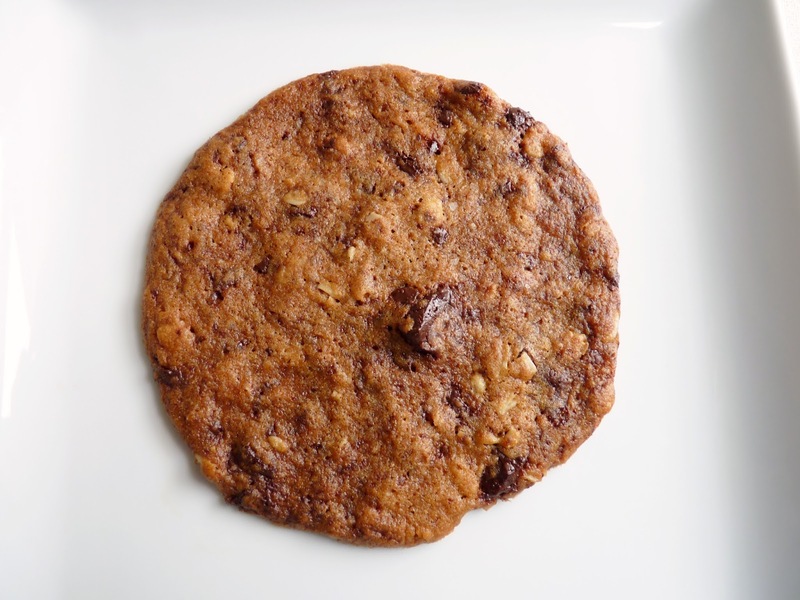 It’s interesting to note that her recipe for this Ultra Thin Chocolate Chunk Cookies comes with a few very explicit dos and don’ts. 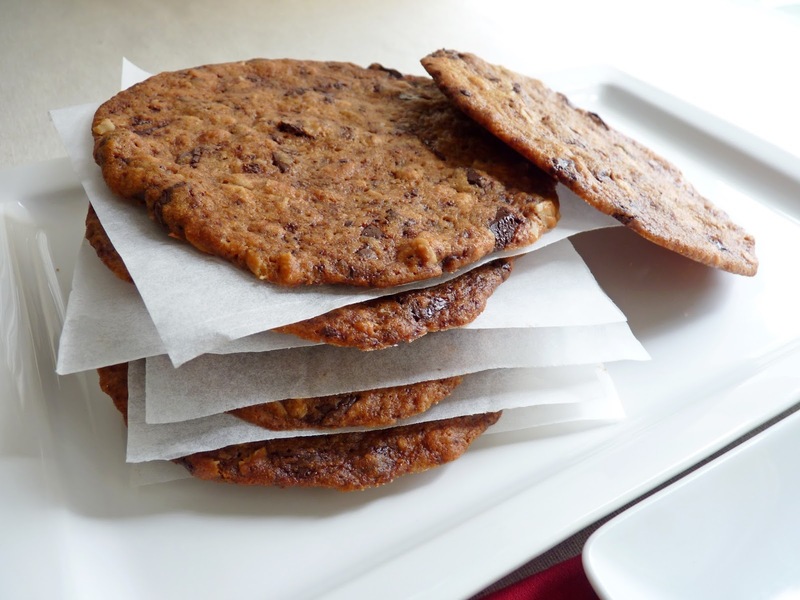 They’re not terribly complicated but they are necessary to achieve the right taste and texture: a dramatically large, ultra thin and crisp cookie loaded with caramel flavor and wonderful bites of chocolate. First, you need to let the cookie dough rest overnight for maximum flavor. Second, these cookies need to be baked on foil for the cookie to acquire the right level of crispness. And since these cookies spread out to about a 5” diameter, you’ll need to place only 5 per sheet pan. You’ll also need to flatten the cookie dough to a diameter of about 3 1/2” before baking so they’ll spread out properly. Lastly, the cookies need to bake for 20 – 25 minutes to achieve the right caramelization and super crisp texture. If you don’t bake them until they take on some good color, they won’t crisp up after they cool. So, if you don’t mind playing by the rules, give this recipe a try. 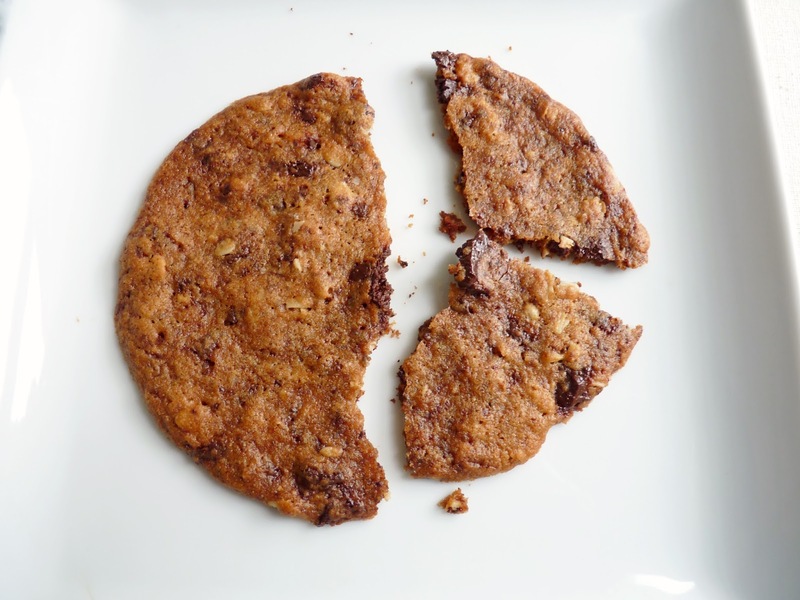 You’ll wind up with quite a good snappy cookie, a worthy departure from the usual chocolate chip variety. - Do follow Alice’s advice on all these steps and you’ll get a full-flavored cookie that really snaps. - Make sure the dough is cool after adding the melted butter before you add the chocolate chunks so they won’t melt while mixing. - If you need to bake these cookies the same day, let the dough rest for a few hours at room temperature. - Slide the cookies and foil onto wire racks and proceed to the third batch. 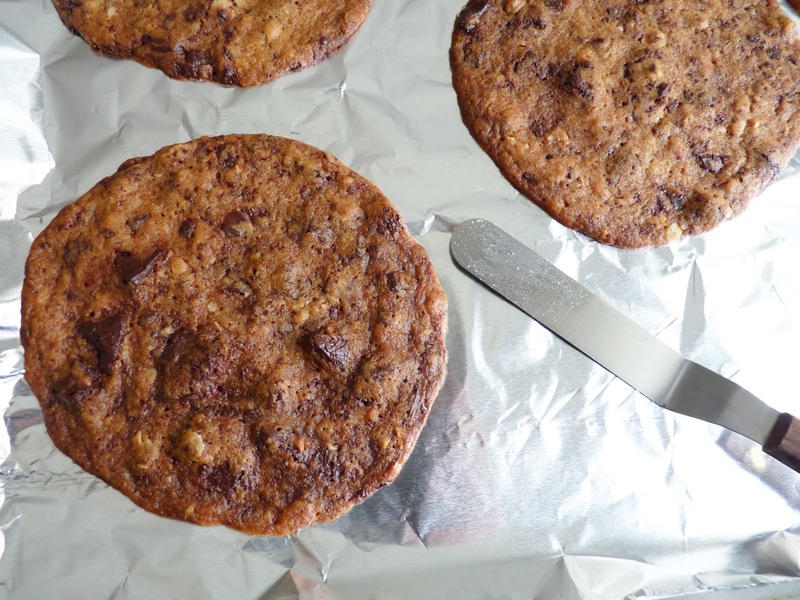 Let the cookies cool on the foil. - A small offset spatula is very handy for removing the cookies after they’ve cooled. - The cookies will keep in an airtight container for about 3 days. Good luck with that. In a separate bowl large enough to hold all the ingredients, stir together the melted butter, oats, both sugars, corn syrup, milk, and salt. Add the flour mixture and combine thoroughly. Stir in the chocolate chunks. Cover the dough with plastic wrap and chill overnight. Preheat oven to 325 degrees F. Position your oven racks in the upper and lower thirds of the oven. Divide the dough into 15 equal pieces, each one a scant 1/4 cup (or 50 grams each if you have a scale). Line 3 baking sheets with aluminum foil. Place 5 pieces of dough (4 in a square pattern and 1 in the center) on each sheet of foil. Use your fingers to flatten each piece to about 3 1/2” in diameter. Bake until the cookies are thin and browned, about 20 to 25 minutes, rotating the pans from top to bottom and front to back halfway through the baking time to ensure even baking. Slide the foil with the cookies onto racks and leave them on the foil to cool completely.